(Never change, Beloved!) Photo by Michael. Ahahahaha! He also looks like he's doing a Stevie Wonder impression. I hadn't noticed that but I bet you're right! 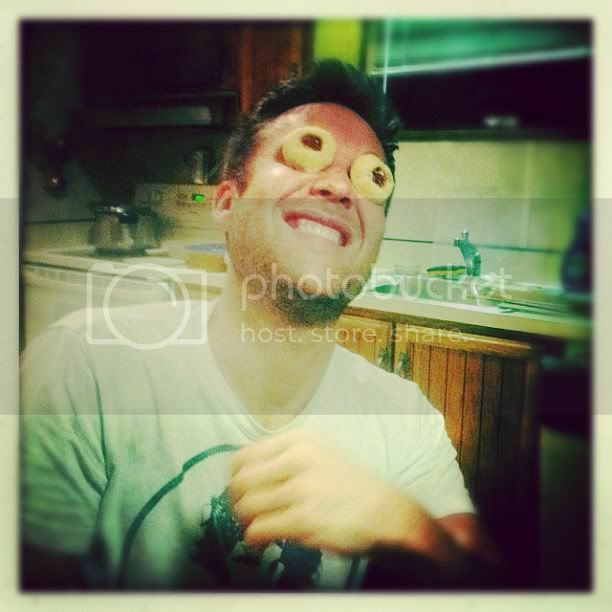 Of course he would see those cookies & think: "those would fit my eye sockets!" Someone call Carvel, we have a new Cookie Puss! OMG, that's perfect! He IS a Cookie Puss. Those have to be the strangest commercials of all time. We don't have Carvel in Canada but growing up I'd see their ads on the Rochester station, along with the Great House of Guitars! May he never grow too old to play with his cookies! I love that pic - Lex should use that as a ploy to seduce Clark. "Lex, we can't be together because you're evil and I judge you!" "Ah, but I have a cunning plan, Clark! See? I shall put cookies on my eyes and act goofy and you shall be seduced by my cookie whiles!" "All right, I'm seduced, let's do it. Also, gimmie two cookies, too." Beautiful! How could Clark resist the combination of Lex & cookies? It could only lead to them asleep in each others arms in a bed full of crumbs! He named his dog after his grandfather? o.o I can just see that discussion, "Well, since you don't have any grandkids named after you, I got you one!" "Ah, Grandson, don't ever change..."
Yes, would love to know if the Grandad is flattered at this tribute! The cookies work scarily well as eyes. Strangely my first thought was that those look a bit like Jammie Dodgers but not quite. I don't think I've ever tried a Jammie Dodger....must make a point of trying one next time I'm in the UK. And if Michael should return for a Con, you could bring him a box. "For your eyes...."
He was very grumpy about the closer last night! Evidently not a 1D admirer.